Bettie Bikini @ MBA Fair! We have a new release mesh bikini available exclusively at the Mesh Body Addicts fair – Opening August 1st. The Bettie bikini comes in 8 colors and has color change options included for the ties on the bikini top and bottom. This set is exclusively for the Belleza mesh bodies and was created for our push up version of each body. Belleza Mesh Creator Application & Agreement – NOW OPEN! 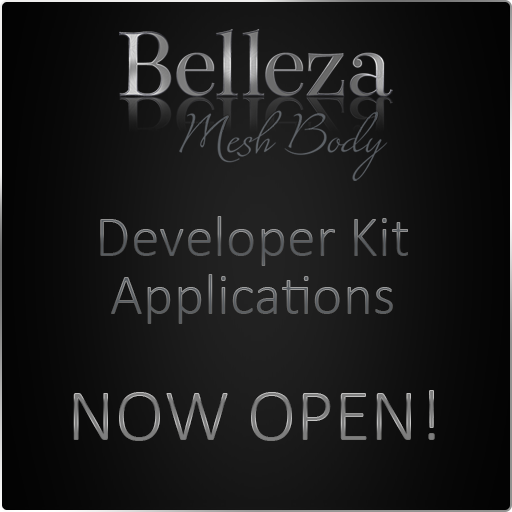 As promised since our update to the Venus, Isis and Freya bodies are now complete and our developer kits have been updated we will now reopen our applications to apply to be a Belleza Mesh Creator. We’re thrilled to open this application and based on the feedback we have had from our small testing group we think you will find our kits very easy to work with. Any previous applications are not applicable. As we’ve updated the body and the kits have changed we are asking anyone who would like to work with our files to please reapply. Please allow for 2 weeks from the time of your application submission for us to review and get back to you about your application. As we anticipate there will be many creators applying we will not be able to respond to everyone. We will both email and leave you a message in Second Life if your application has been approved (again, within 2 weeks time of your submission). You must be an active creator in Second Life and fill out your form completely, any incomplete forms will be ignored. Belleza reserves the right to approve or deny any application based on our discretion. All applications will be reviewed by Felicity Blumenthal, please do not contact Tricky Boucher regarding your application.